Goal: To balance a bone at the end of your dog's nose. You'll need an evenly balanced treat for this trick. Start with your first two fingers under the dog's collar right under his chin, your thumb and last two fingers on either side of his muzzle. Lightly hold his muzzle still. If your dog fights this position, pause here and feed him until he's comfortable with you holding him like this. Once your dog in comfortable in this position you may begin to place the bone on his nose. 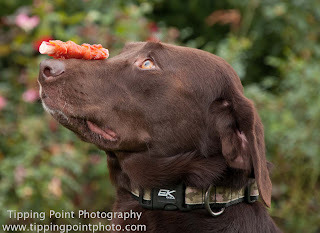 Only ask him to hold it for a short time before releasing your grip on his muzzle so he can get the treat. As your dog begins to understand that holding still is what you want you may slowly release your grip on his muzzle and still have him stay with the bone on his snout. When you tell him to get the bone use his release word or 'get it'. You may tell your dog to 'stay' while holding the bone. Keep building time and if you want to be a super rockstar you can add the number of bones your dog holds on his nose.